"A must have for all bath lovers. The perfect addition to you bathroom. 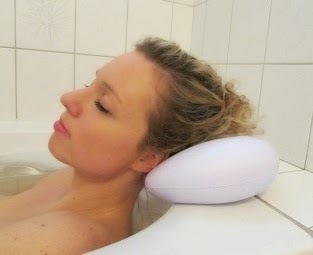 Curv bath pillow is also a great gift for anyone looking to distress and enhance their experience while taking a bath. " I was sent a bath pillow from Curv to review. The price for this pillow is $24.95. Shipping is free with Amazon Prime. I am glad to write that this pillow arrived in great condition. There were no dents, leaks, nor defects in the package. The pillow was shipped inside of a plastic bag. The package measures 11.0" x 10.0" 3.0". The back of the package is a warning sticker. The bag is easy to open, it has a tab that you pull, and it opens from the bottom. Bath time means relaxation, so what's better than to have a pillow that you can use inside of the tub? This pillow is curved, so it's a lot comfortable than something that is purely rectangular. This pillow has two suction cups on the back, so you can stick it to the side of the tub to reduce movement. It sticks easily (which is surprising, because I have terrible luck with suction cups!). It fits nicely onto the curve of my tub. Curved, so it really supports your neck and head. The suction cups help it stay in place! As my first ever bath pillow, I must say that I've really been enjoying it! It really changes a bath. No more cramping neck, this really helps support it! It's definitely a luxury item, and one that I highly recommend! Are you wanting to try the Curv Bath Pillow, too? Click the link below, and order away! I need one of these! Lol, lock the door to the bathroom and relax with no kids screaming for me. I love the suction things on the back of it so it won't slip.